Here is the latest version of the macro manager I created. 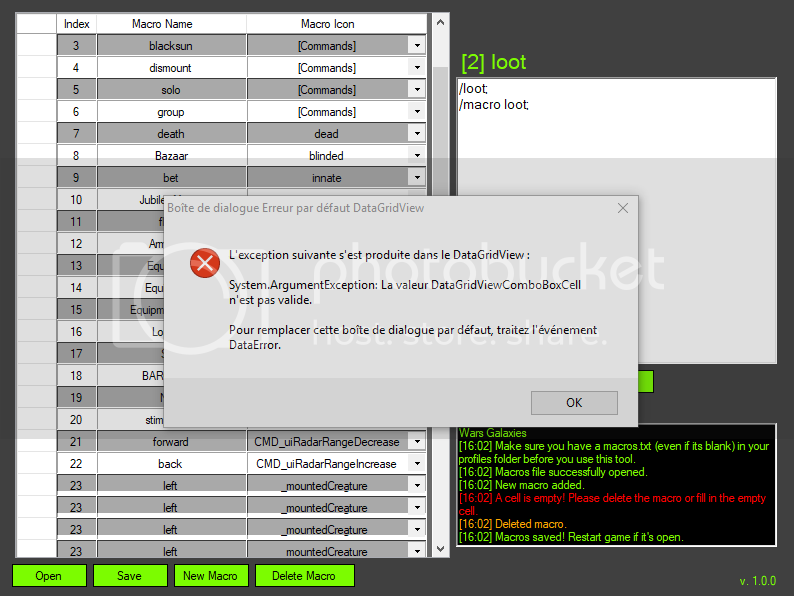 You are able to delete, create, modify macros offline and edit the macro code the same way you would in-game. This was created based off the request of one player. If you find any bugs, flaws, etc please message me in discord or on here and I will work on fixing it. Uploading takes me a little bit due to the fact I'm currently deployed to Africa. Step 1: Load your macros.txt from your swg folder. Step 2: Macros should populate in the tool. Step 3: Modify Macro. To modify macro code double click the header of the macro you want to edit. (Aka the gray box on left side of the row that has your macro that you want to edit). Once you double click, it will populate in the right side box. Once you have editted it, just click Apply under the macro code box and it will update the Macro code for that specific macro. Step 4: Once completed, click save and the logger in bottom right corner will notify you if it has saved or if there is an error. Step 5: Restart or Start Game. I was looking for that kind of tool. So I did try it. It's a good tool but I get some pretty annoying bug, each time I scroll. Send me your macro.txt so I can attempt to duplicate it. I think I have found where the error came from. My macros.txt was the one I was using during CU and NGE. And with SWGEmu some icons where replaced with this "CMD_uiService" by default (a blinking icon IG) which was causing the error. A macro manager has been sorely needed since the launch of SWG. Being able to edit, add, remove, or change the order of macros, icon change and preview and various sort options would be exceptionally handy. Also, current link is dead. mind posting a new link, would love to try this. Here it is. As someone with 200+ macros, I couldn't live without this. Thanks for posting. I gave it a try and had some issues. After adding 7-8 new macros and saving them... load ingame and they all only had 1 line. Tried to reload the new file into the manager and it gave me an error. Very glad I backed up my file before I started. Screenshot of what you did/added so I can debug.